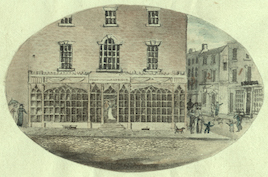 Both Thomas Bewick and his son Robert had strong links with Tynemouth, and also a social and commercial relation with early members of the Spence / Foster family. In the later 19thC several members of this family were involved in piping. THOMAS BEWICK visited Tynemouth frequently, and it was there that he wrote the first part of his Memoir during November and December 1822. One of his many friends was Robert Foster of Tynemouth, the father-in-law of Robert Spence (and therefore a progenitor of the Spence / Watson family). Foster knew Bewick well enough to call on him unexpectedly at home, as reported by the geologist Adam Sedgewick who was taken by Foster to meet Bewick whilst they were out walking. In view of this it seems likely that Bewick would have visited Foster when staying in Tynemouth. In addition to tuition fees, the expenses covered unspecified cash payments, a music book, repairs to bellows, and music ‘pricked out’ by a Mr. Aldridge and a Mr. Halgarth (possibly William Halgarth, printer and bookseller of South Shields). 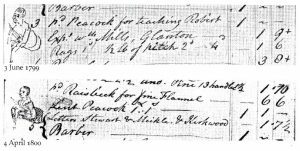 In July of 1800 Bewick paid 14/- (14 shillings, or 70 new pence) for a new chanter. In his important essay about piping expenses recorded in Thomas Bewick’s accounts, Iain Bain suggests that this might have been the newly-developed keyed chanter. In 1801 Bewick was at charges for the repair of Robert’s chanter, and in 1802 for a new bag. 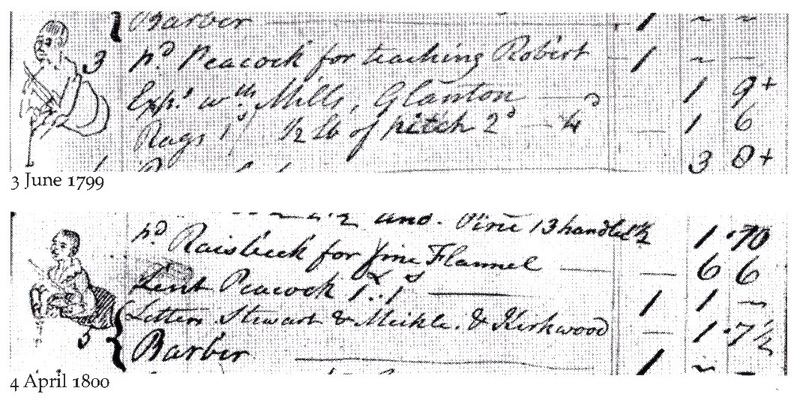 A reference in 1809 to payment for a “lesson on the New Pipes” might suggest that Robert was given a new, multi-keyed set of pipes for his coming of age. In his Memoir Thomas relates that he asked “old William Lamshaw, the Duke of Northumberland’s Piper” to play at a theatre for the impresario Charles Dibdin (NB Bewick spelled the as Dibden name in his Memoir) after Dibdin’s entire company were in dispute over earnings and had refused to perform. This probably took place around the early- to mid- 1770s, and implies that Thomas knew Lamshaw (the grandfather of the younger William) reasonably well, and so may well also have know the younger William, especially when both were in North Shields / Tynemouth between c.1798 and 1806. As a youngster ROBERT BEWICK was an enthusiastic, and perhaps even mildly obsessive piper. The repairs to his chanter and the replacement of his pipe bag suggest heavy usage. In 1801 Thomas wrote from Tynemouth to his sister-in-law, “Little Rob: is (while I am writing this) playing John’s new tunes of peace & plenty &c to old Willie Dean, in the Kitchen …“, and in 1799 Robert himself writes to his sister, “… and when I was in the country I played all my Tunes at Eltringham and Mount Hooly, and I would have been glad to go to Shields to play all my Tunes at Betty Skipsey’s Birth Day but my father dare not trust me out of his sight ….“. Neither Willie Dean nor Betty Skipsey have yet been identifed with certainty and, unfortunately, Robert’s term “Shields” is ambiguous and could refer to either North or South Shields. Although it must remain speculation, it seems probable that Thomas would have visited his friend Robert Foster while in Tynemouth, and would have known his family. It is possible, even likely, that Robert would also have met them. If this was so, then it is tempting to imagine that the young, mildly obsessive, piper might have been allowed the opportunity to “to play all my Tunes” to his father’s friends, and so might even have stimulated that family’s awareness of Northumberland piping. As an adult Robert sustained his early interest in piping. He kept and maintained the manuscript tunebooks which may, perhaps, have been started by John Peacock. More than two decades after Robert’s death his sisters gave the tunebooks to Joseph Crawhall. The Bewicks are linked with John Peacock. John Peacock is linked through the Newcastle Volunteers’ Concerts and other events to identifiable local musicians including Alexander Kinloch (also spelt Kinlock). 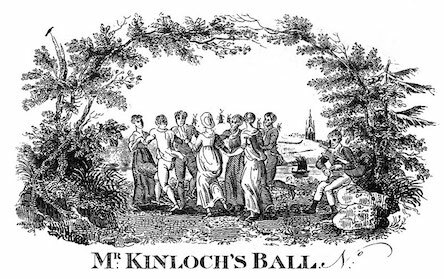 The Bewicks, though, also have a proven link with Alexander Kinloch; in c.1812 Robert engraved the copperplate from Thomas’s preliminary pencil study for tickets for “Mr. Kinloch’s Ball”. This portrays four women and three men dancing in a circle to a Northumberland piper’s music. The scene is set in a sylvan grove with a view to the distinctive crown on the spire of St Nicholas’ parish church (now the Anglican cathedral), across the river on which is seen a square-sailed Tyne keel under sail. Given that Robert engraved this it might be assumed that the portrayal of the piper is accurate, and possibly even a representation of himself. One interesting feature of this image, and also of the marginalia in Thomas Bewick’s account books, is that the drones of the pipes are held at quite a steep angle, rather higher than the more horizontal position typical of today’s players. This may reflect an early playing style. Two of the tunes in Robert Bewick’s Mss note-books have titles relevant to North Shields and Tynemouth; one of these is “New Road to Tynemouth” and the other is “Shields Fair”.